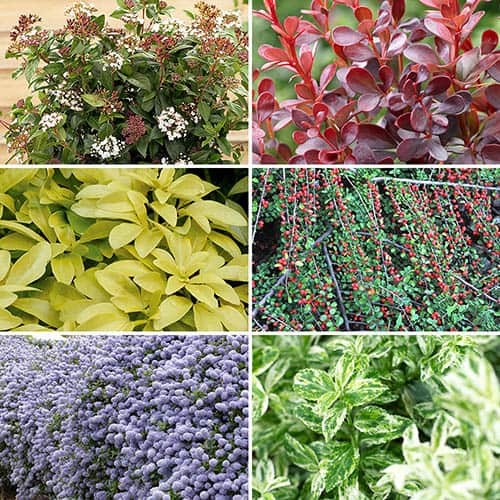 A great value collection of evergreen shrubs, giving year-round leaf colour and interest. Ideal for filling gaps in border, or creating low maintenance screens or shrubberies. Each plant is easy to grow and requires little maintenance. A mix of 6 of the best foliage plants. Supplied as a set of 6 named shrubs, in 9cm pots, ready to plant straight out. You can now enjoy true year-round interest with vibrant flower colour and year-long foliage interest in this superb, all-in-one hardy collection! These six tried and tested garden winners will fill any gaps you might have in your existing beds and borders or allow you to plant a new one from scratch. Once planted they will rapidly grow away and look tremendous from this year onwards, providing a stunning visual display and a degree of privacy and security for you, as well as a natural safe haven for a wide variety of wildlife. Each plant is easy to grow and needs very little maintenance. In a mixture of colours, this collection of hardy shrubs are guaranteed to brighten up pots, patios, beds, borders – wherever you fancy planting them! Plant together for a vibrant, year round mix of colour, or plant separately and frame beds, borders and patios. Supplied as a colourful mix of 6 evergreen foliage colour plants in 9cm pots.